A second-generation hub is the key to this platform's appeal. The Internet of Things is everywhere, reaching even the interior of your fridge. Yet as the buzz approaches fever pitch, a sizable percentage of the connected tech available today remains isolated in siloes. One sensor can tell me if my garage door is open or closed, but it can’t turn on the smart light bulbs inside my house when I open the door at night. 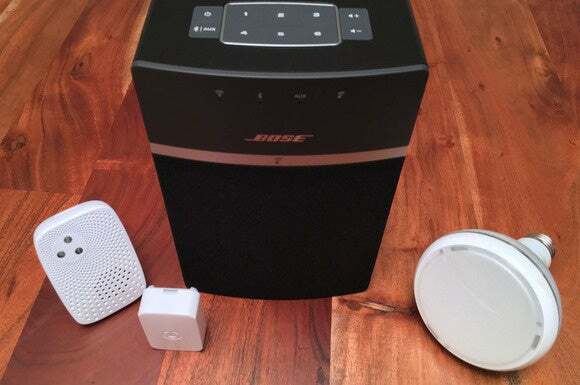 My Bose audio system can play music in every room in my house, but I need to launch a different app when I want to dim the lights to hear mood music with my romantic dinner. SmartThings, acquired by Samsung in 2014, promises to break down those silos and integrate all the smart devices in my connected home into a single mobile app. And it comes pretty close to delivering on that promise. A small hardware hub at the core of the SmartThings experience bridges multiple network protocols and acts as the local command center. While the second-generation Hub can be purchased on its own for $99, most people will get started with the $249 SmartThings Home Monitoring Kit, reviewed here. 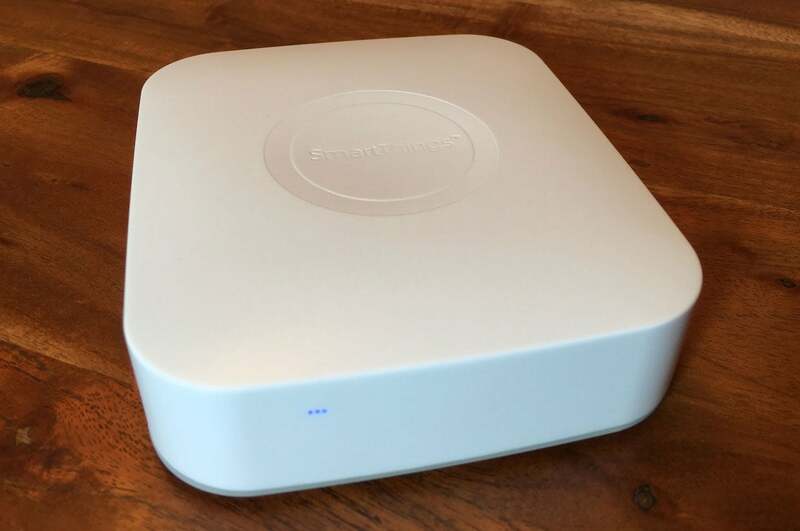 The SmartThing Hub itself is an inoffensive, compact, white plastic block that’s not much larger than a Roku. Its diminutive size and general good looks are notable compared to the much larger and less-attractive [and now discontinued—Ed.] Staples Connect and Wink hubs that it competes with. Unlike those devices, however, the SmartThings Hub must be hardwired to your router (the others connect over Wi-Fi). 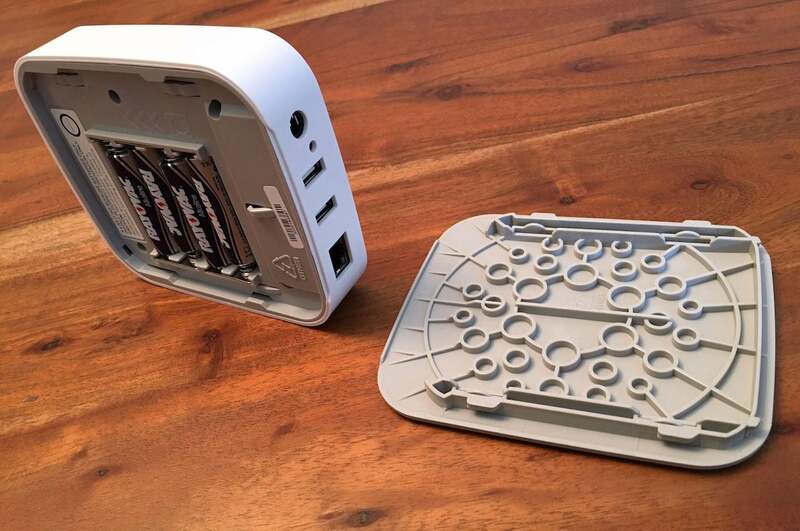 This petite, second-generation hub, which houses Z-Wave and ZigBee radios, powers the SmartThings connected-home platform. 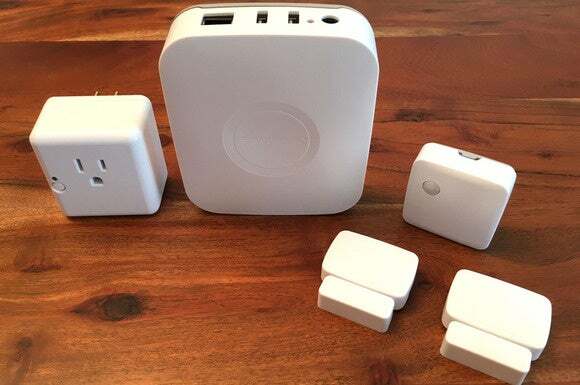 In addition to the SmartThings Hub, the Home Monitoring Kit bundles several ZigBee components, collectively known as Things: two door/window sensors, a motion detector, and a plug-in lamp/small-appliance module. In addition to the kit, SmartThings also sent a leak detector and a wireless siren for this review. They also sent a security camera that we will review later. 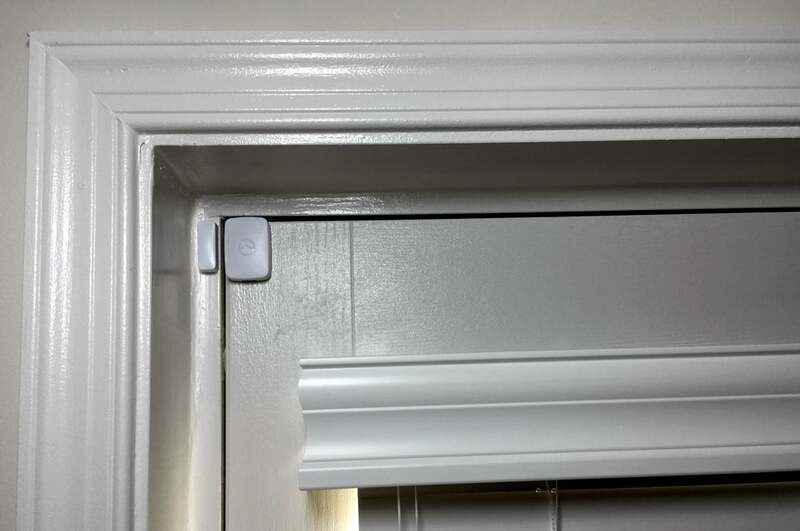 The company indicates its updated line of ZigBee sensors are one-third the size of its previous models, and I found the door/window sensors to be extremely innocuous once installed. The two-piece units can be mounted to doors, windows, and even garage doors using the included double-sided tape or by screwing the corresponding backplate into your trim or wall. The motion sensor is similarly slim, and each of them is powered by a CR2450 coin-cell battery—no old-school wiring here. The lamp/small-appliance plug-in module is slightly bulkier and of course depends on AC power, but it’s also more likely to be placed out of sight. In addition to informing you when motion is detected and if your door or window is open or closed, the sensors also monitor the temperature in their proximity and can trigger the small-appliance module to turn on a window air-conditioning unit to cool a hot house, or to fire up a space heater if a room gets too cold. The SmartThings door/window sensors will also monitor and report the ambient temperature. They can trigger a SmartThings lamp/small-appliance module to turn on a fan or small air conditioner when the room gets hot, or a space heater when it’s cold. This starter kit does just that: It gets you started. Unless you live in a very small house, you’ll want to add other components to expand the capabilities of your system and to expand control to additional rooms in your home. There are several other SmartThings products to choose from, including a leak sensor, an arrival sensor that sends notifications when the bearer arrives home, a humidity sensor, and a security camera. 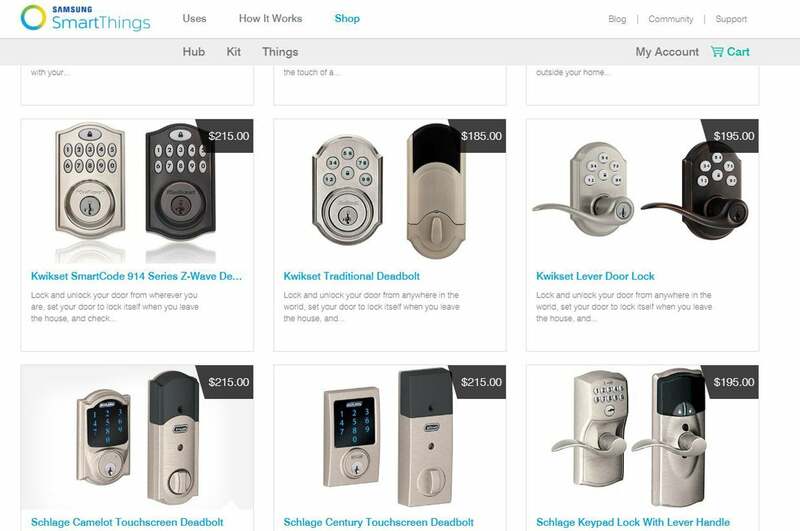 You’ll also find a number of compatible third-party devices in the SmartThings store, including smart entry locks from Schlage and Kwikset, in-wall ZigBee and Z-Wave light switches and dimmers from GE, a smoke and carbon-monoxide detector from First Alert, emergency sirens and strobes, remote controls, and more. A SmartThings system can also incorporate other classes of devices, including third-party smart thermostats and smart light bulbs, Amazon’s Echo digital voice assistant, Belkin’s WeMo connected-home products, and even Bose SoundTouch and Sonos multiroom audio systems. While you won’t find these products for sale in the SmartThings store, the company does provide online tutorials for incorporating them into a SmartThings system. You can incorporate a variety of smart locks into your SmartThings system, including numerous models from Kwikset and Schlage. As complete as that ecosystem sounds, holes remain. In some cases, such as with Chamberlain’s MyQ garage-door controller, you’ll need to rely on fellow users posting helpful tips in the SmartThings’ community forums to figure out workarounds. In other cases, you might just be out of luck, as I discovered when I tried to enroll my existing Lutron Caseta Wireless lighting controls into the SmartThings system (Lutron’s Pico remotes are super handy). For the next step, the app prompted me to discover existing Things by removing the temporary shipping spacers separating the batteries from the electrical contacts on the motion sensor, the multipurpose modules, and the leak detector. Each device immediately powered up so the Hub could find them. Similarly, plugging the lamp module and the siren into power outlets rendered them discoverable. I had everything added to the app in no time at all. But that’s where the simplicity ended, leaving me wondering what to do next. SmartThings offers apps for iOS, Android, and Windows Phone, but expect to invest some time to master them. While I found the SmartThings iOS software polished and attractive enough, routine operation is marred by arcane icons and competing, redundant paradigms. There is a definite learning curve and at this time, only the tech savvy need apply—at least when it comes to setting the system up and enabling its features. Once everything is operational, the rest of the family will benefit from your time investment. As I mentioned above, Things are the individual components of your smart home: The connected light bulbs, motion sensors, smart door locks, and so on. During setup, you associate each Thing with the Room it will be installed in. You then establish Routines that trigger various Things to behave in certain ways at certain times. The Goodnight! routine, for example, might tell the SmartThings hub to lock all your doors, turn out your lights, and adjust your home’s thermostat to an energy-saving temperature while you’re snug in your bed. For more robust control, you can install SmartApps that tap deeper into the capabilities of Things. SmartApps can also control devices outside the SmartThings universe, such as a Sonos multi-room audio system or Philips Hue LED lighting. Some SmartApps come preinstalled with the SmartThings mobile client app, while others are acquired through the SmartThings Marketplace (accessed via the mobile client app). If you’re inclined to write code, you can even create SmartApps of your own. To put SmartThings through its paces, I outfitted my largely tech-free basement as if it were a smart apartment. I placed one multipurpose sensor on the exterior door and another on the single window, with the water leak detector finding a spot next to our sump pump (a common fixture in my region). I placed the motion detector on a ledge near the stairwell, and plugged a floor lamp into the lamp/small-appliance module near the seating area with the siren nearby. SmartThings works with a wide array of connected products, including third-party hardware such as the Bose SoundTouch and Philips Hue LED light bulbs. The manner in which these devices interact—with each other, with third-party products, and with the surrounding environment—is completely up to the end user. The objective isn’t to have a single user interface for manipulating the various gadgets. The real power comes from having them interact with each other, based on schedules, thresholds, security-camera activity, events, and even your physical location, based on smartphone geolocation. One of the first scenarios I tried was based on the leak detector sensing moisture: The SmartThings Hub sent a text message to my phone, activated the siren to blast its horn for a few minutes, and triggered the Philips Hue LED lightbulbs to bathe the upstairs family room in red light until the motion detector sensed someone coming downstairs to investigate the leak. For more everyday utility, I also programmed the system so that the lamp module turned on a light in the basement each time the motion detector sensed someone coming down the stairs. The light would turn itself off after 15 minutes in the absence of any further motion. I could have also programmed the Hub so that the door/window sensor sounded the alarm and turned on the light if the basement door opened between 9PM and 7AM—a window of time when no one should be going into that space. Relying on servers in the cloud allows a service provider like SmartThings to deploy much thinner and less expensive hardware on the ground. It also makes for easy remote access. But there’s a significant downside to over-reliance on the cloud. No one wants to resort to Flintsones-era control of their tricked-out smart home just because they’ve temporarily lost Internet access due to a power outage, a broadband service disruption, or routine maintenance gone awry. So SmartThings wisely decided to integrate more local control into this, its second-generation offering. That means some Routines and SmartApps will continue to function even in the absence of an Internet connection—but only if the SmartApps and the Things they’re controlling can also operate without Internet access, and it’s often difficult to determine which ones can and which can’t. The SmartThings hub has Z-Wave and ZigBee radios, so it supports two of the most common connected-home protocols (it also supports Internet Protocol). That enables it to create a self-healing mesh network in which every node—be it a light bulb, an outlet, or a dimmer switch—has the ability to pass along a message that’s intended for another node. The more devices you have on the network, the larger the network can be. If one device drops off the network, the hub can rebuild the network based on the nodes remaining—provided the distance between the remaining nodes isn’t too great. A SmartThings network’s resiliency is further enhanced by the hub’s battery backup. If your home suffers a power failure, the hub can still control the network devices that also have battery backup or that run on battery power (your door locks and most of your sensors, for example). If an abundance of nodes depend on AC power, on the other hand, the network might not be able to heal itself during the outage because the mesh has developed too many holes. But this is true of any mesh network. Is SmartThings the way to go? 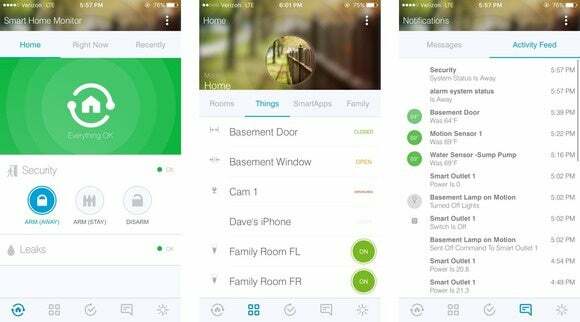 Over a few weeks of use, I found the SmartThings Home Monitoring Kit and its related services to be reliable and responsive—much more so than both the Wink hub and its connected devices and the first-generation SmartThings system. With this system, the elapsed time between the motion sensor being triggered and the connected lights coming to life, for example, was consistently brief and it never failed. While I find the Staples Connect system to be easier to use, and I prefer its emphasis on local control versus relying on the cloud (not to mention its Lutron Caseta wireless lighting support), I think SmartThings delivers the more extensible platform, one that is more likely to enjoy ongoing development. I like what I see and most of the pieces are here, even though I think the app could use some retooling. Getting started with the SmartThings ecosystem is a relatively affordable proposition, but your investment will quickly escalate as you expand beyond what’s in the starter kit. You can mitigate the impact on your budget with a piecemeal approach—you don’t need to acquire everything at once, unless you want to. But once you get a taste of the connected home, you’ll want to. With Samsung’s backing, former startup SmartThings improves on its original connected-home offering, delivering increased power, polish, and reliability for those willing to master the system. Dave Zatz is a geek blogger, powered by nerd rage. Living the gadget dream.